Three teams of undergraduate students (four students to a team – including Tyler Astor, Greg Benz, Michael Chikos, Ryan Daddio, Nicholas Delmar, Kyle Genova, Kenneth MacNish, Mike Monzon, Jianlong Sun [Jason], Yuanshuo Qu [Henry], Lingcheng Zeng [Aaron], Lorabeth West,) from the Rutgers Turf Club competed in the 2013 Turf Bowl Competition at the International Golf Course Superintendents Association of America Conference and Trade Show in San Diego, CA on Thursday, February 7, 2013. 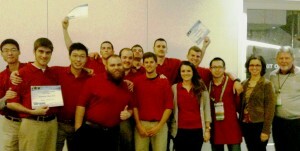 The Rutgers Teams placed 6th, 14th, and 48th out of 68 university teams from throughout the United States and Canada. Rich Hurley (Adjunct Professor, Plant Biology and Pathology), Sabrina Tirpak (Principal Lab Technician, Plant Diagnostic Laboratory; Plant Biology and Pathology) and Bruce Clarke (Extension Specialist, Plant Biology and Pathology; Director, Center for Turfgrass Science) assisted the Rutgers teams prepare for this year’s competition. This was the first time that a Rutgers Team has cracked the Top 10 of this prestigious academic competition. CONGRATULATIONS TO THE 2013 RUTGERS TURF BOWL TEAMS!!! !